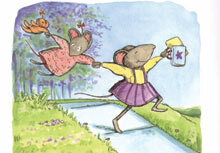 "Sheila Rae, a confident young mouse, isn't afraid of anything, until she decides to walk home from school a new way and proceeds to get completely lost. Laura Hampton presents a delightfully cocky Sheila Rae, who quickly changes to a quiet, then scared, then hopeless mouse, as she realizes just how lost arid alone she is-until her sister, Louise, pops up. Hamilton's voices are consistent and telling. Louise, who starts out meek, takes on character and strength as the story moves along, while the opposite is true for Sheila Rae. Hamilton's cocky, tentative, and scared voices are just right, and the background noises -- thunder and lightning, dogs barking, kissing sounds-all work together to make the story come alive. A great book for families, beginning kindergarteners, and fans of Kevin Henkes." "Laura Hamilton does a wonderful job in this reading of Kevin Henkes' popular book (Greenwillow, 1987). Sheila Rae's self-proclaimed bravery is nowhere to be found when she finds herself lost on the way home from school one day. In an act of sibling-love, her little "scaredy-cat" sister helps out and saves the day. Appropriate sound effects are liberally infused in the recording, along with an occasional musical interlude, heightening the feelings of fear, helplessness, and finally triumph that listeners will feel right along with Sheila Rae. Henkes' gift for writing and illustrating is nicely complemented by this recording. Wonderful for read-alongs (especially for little sisters! ), this title will be useful for emergent readers as well as general listening."